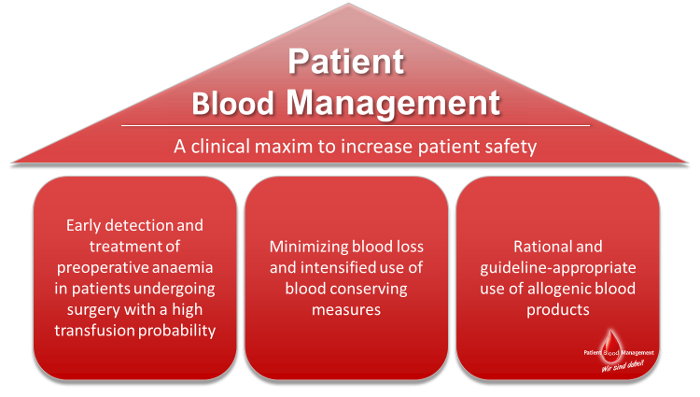 The motivation for implementing Patient Blood Management is based on the finding of anaemia, especially in the operative setting, representing a risk factor for increased odds of in-hospital mortality as well as additional complications. All too frequently, patients already have insufficient blood volume when presenting for surgery. During hospitalisation, intra- and postoperative blood losses as well as diagnostic blood losses from phlebotomy can further impair patient’s own blood volume. Commonly, and in many cases without considering alternatives, treatment is primarily realised based on transfusing allogenic red blood cells. Providing an optimal preoperative preparation as well as reducing blood losses during hospitalisation are two prime goals of Patient Blood Management. Prior to surgery, patients are checked for anaemia. In many cases anaemia is caused by empty iron stores that impair a sufficient blood formation. If so, blood production can be amplified via iron supplementation, allowing patients to increase their blood volume by own efforts. Additional care is taken so that blood sparing techniques are used intra- as well as postoperatively. For instance, coagulation is optimised, and blood lost during surgery is salvaged, washed and retransfused. Whenever possible, smaller blood collection tubes are used to reduce the volume of phlebotomy related blood losses. Owing to technical advances, in many situations smaller blood collection tubes can be used to reduce phlebotomy related blood losses without impairing the quality of diagnostics. Consequently, blood remains where it is needed: Within the patient’s body! These measurements not only allow for a better patient recovery they also help to reduce the application of allogenic RBC and thereby to spare this valuable resource. If indicated Patient Blood Management supports the rational use of allogenic RBC. For detailed information please see medical rationale.